The next part of this trip was basically a game of opposites. 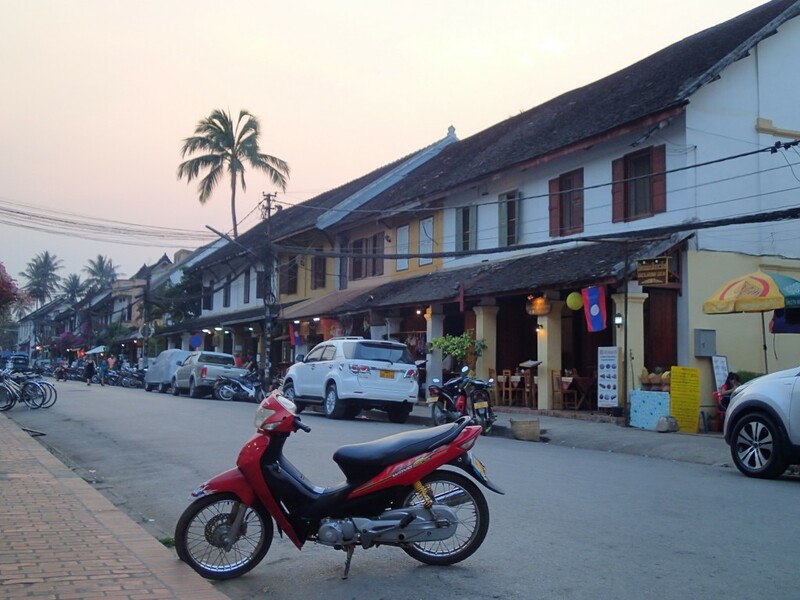 We first stayed at the old, cultural heart of Laos amid beautiful French colonial architecture and dined in delightfully French themed bistros. 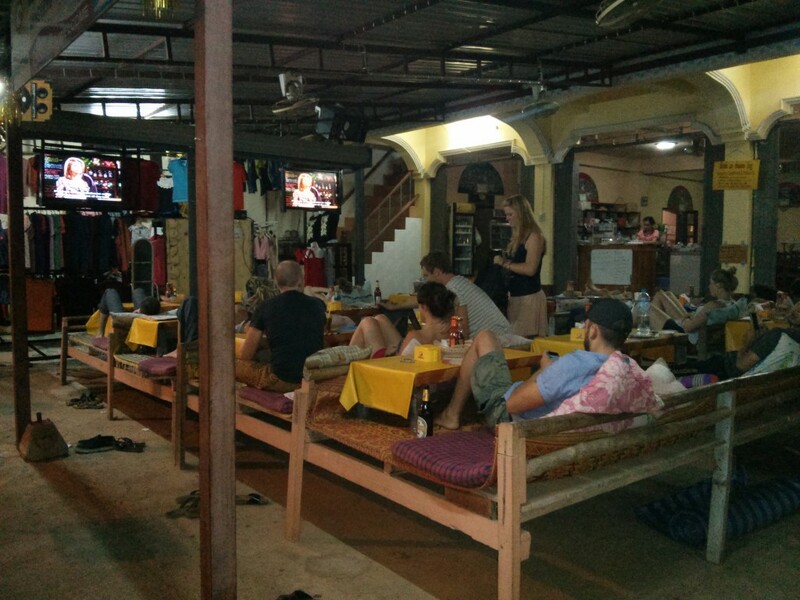 We then went to Vang Vieng which was once a haven for those seeking a debauched, drug taking, alcohol-fuelled party in some of the most beautiful surroundings you can imagine. Luang Prabang is a beautiful old town sandwiched between two rivers and at some points a well struck nine iron could take you from one river to the other. It is a pretty small place and yet everyone we met said ‘you must stay for ages, it’s so beautiful and tranquil (man)’. It was a beautiful place, but as we mentioned before it was small. It was also outrageously, oppressively hot. The sort of heat that makes you think somebody turned the temperature gauge up on the sun. As such, we sort of felt like we had seen a lot of Luang Prabang after a few short hours walking around and decided that the best way to deal with the heat was avoid it and try and rest up for future adventures. We also had a load of admin stuff to do that doesn’t make for great reading. 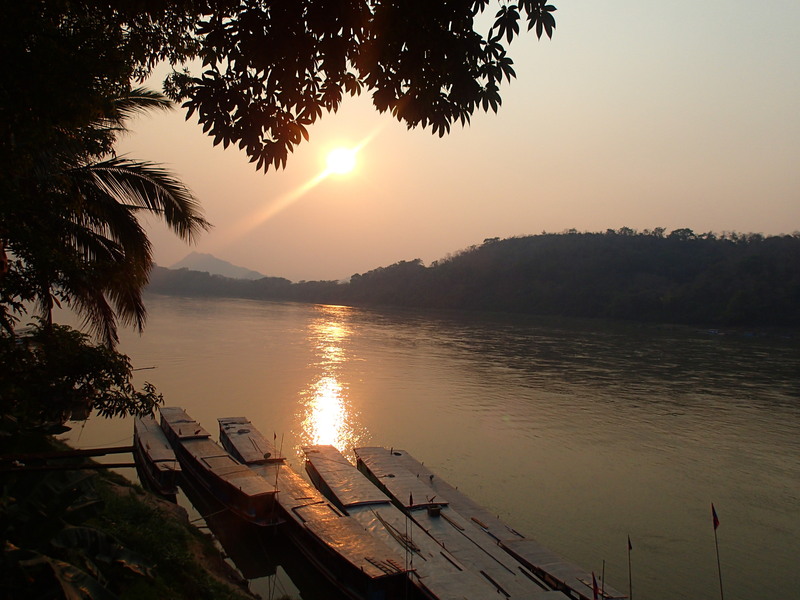 So we simply enjoyed our evenings at the very nice restaurants and watching the sun set in various bars along the Mekong and then retired to rest for much of the rest of our time. We had a beautiful guesthouse about 3km out of town set next to the river and in stunning gardens with huge butterflies flitting about. A big bed with an even bigger mosquito net was also a great comfort given the malarial mosquitos that seem to be everywhere. They served us breakfast on our own little balcony every morning and it was an awesome place to relax. 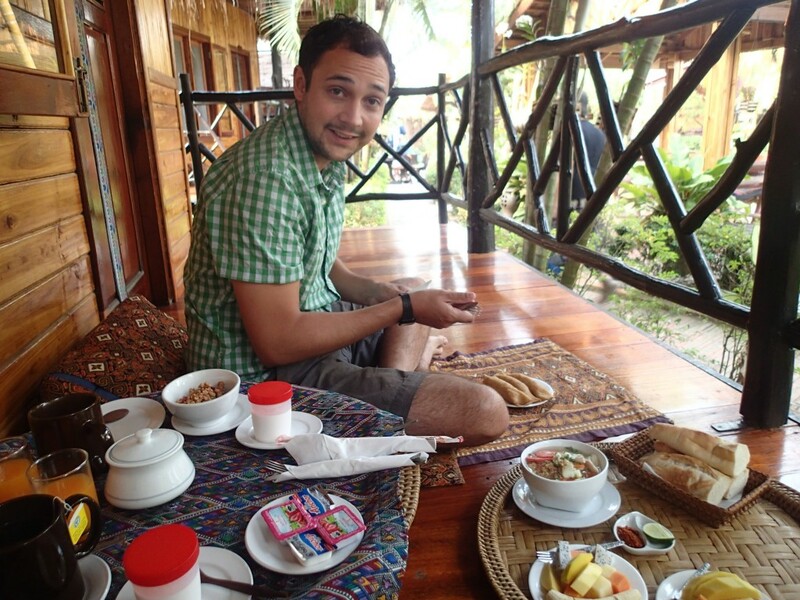 If ever in Luang Prabang it is called Thongbay Guesthouse. The food in town was fantastic with some notable highlights including a venison terrine served with a delicious mango, pineapple and red pepper chutney. We also ate smoked salmon! It was amazing to have something like smoked salmon having eaten South East Asian food for the last three months. An utter joy in orange, velvety smoothness. Jen even managed to procure for herself a nice glass of wine (a first in South East Asia) whilst I ploughed on with the big BeerLao. We did try and visit every top restaurant that was recommended to us as we were enjoying nine days of celebrations for our nine year anniversary. 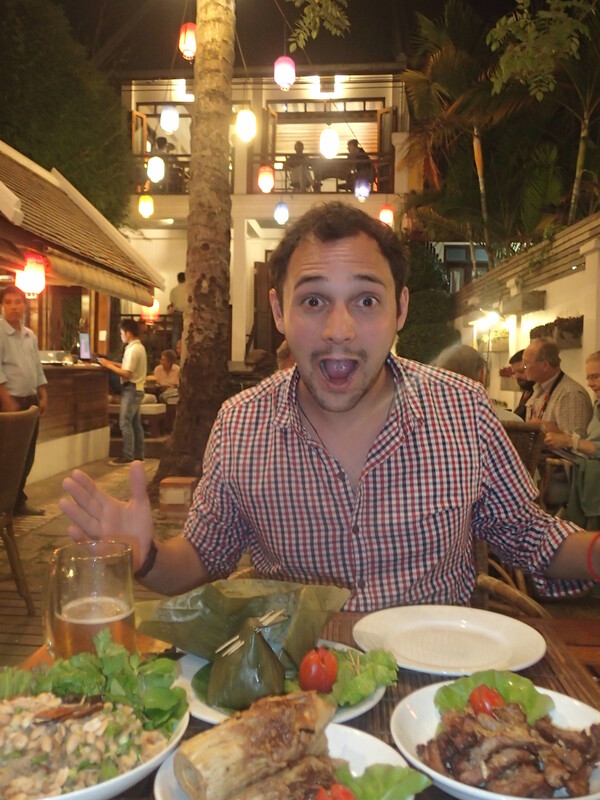 The main reason for this was our actual anniversary was spent in Pakbeng – the town that electricity forgot! We enjoyed some truly great food here and would recommend L’Elephant and Tangor especially although the stuffed bamboo shoots with pork at Coconut Garden were ridiculous. We probably didn’t give Luang Prabang our best shot; there was a trip out to some waterfalls but we were warned they would be very busy and generally we were feeling pretty knackered so we ducked that one. We tried to rest up and make some more plans for the next few weeks including visiting the world’s biggest cave in Vietnam! Apologies therefore to Luang Prabang and we would definitely recommend visiting but perhaps not in this heat and perhaps during the water festival that marks the Laos New Year in April. Next up after our poor performance was Vang Vieng. A short (hah) bus ride over the mountains which never seemed to end – probably because we stopped every hour to let the engine cool down. We did eventually make it and hot and sweaty tuk-tuk’d our way into town and were dropped somewhere near our guesthouse. For the first time in our stay we reached our pre-booked guesthouse and were met with the classic “no room available”. In our less than happy state we shrugged walked next door and dropped our bags. 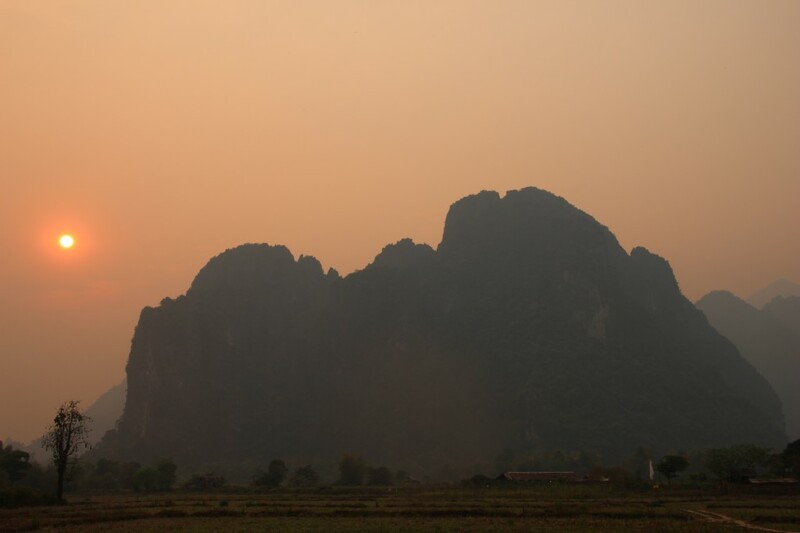 We did have an absolutely stunning view as the sun set behind a massive limestone karst (basically a sharp hill) with nothing but fields, paths and scurrying chickens to spoil it. I was in a pretty foul mood as I was struggling with a cold (I know it’s ridiculous, 38 degrees and still picking up a cold!) and just wanted to get out and have a beer in town. This we did and it was certainly a strange place alright. Essentially the village runs parallel to the river with one street with bars and guesthouses on the river and another that sits back from the river by about 100 yards. There is also a small island in the river which used to be the anything goes island but the government cracked down on it and it is now just guesthouses and quieter bars. 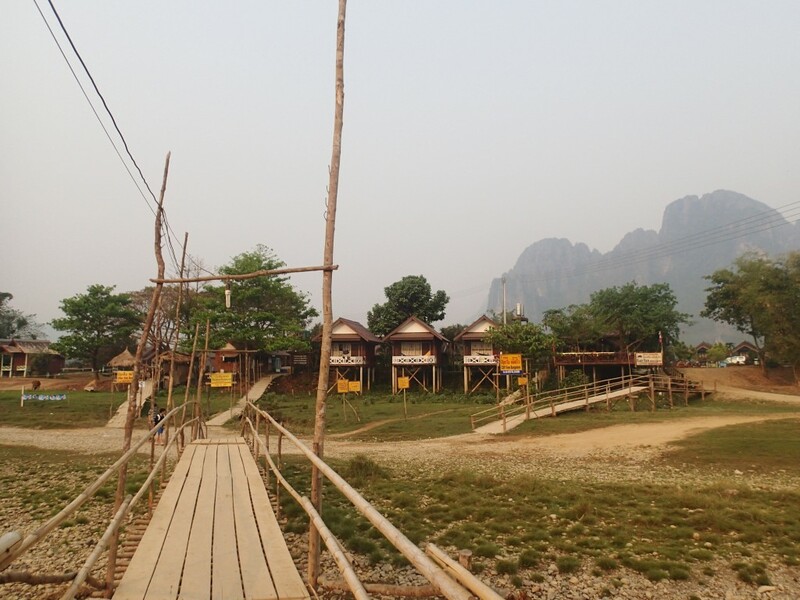 Vang Vieng is the village/town that was once famous for its tubing. You grab a big inflatable donut ring, get driven about 3km upstream and then float down the slowly meandering river looking up at the glorious limestone karsts. 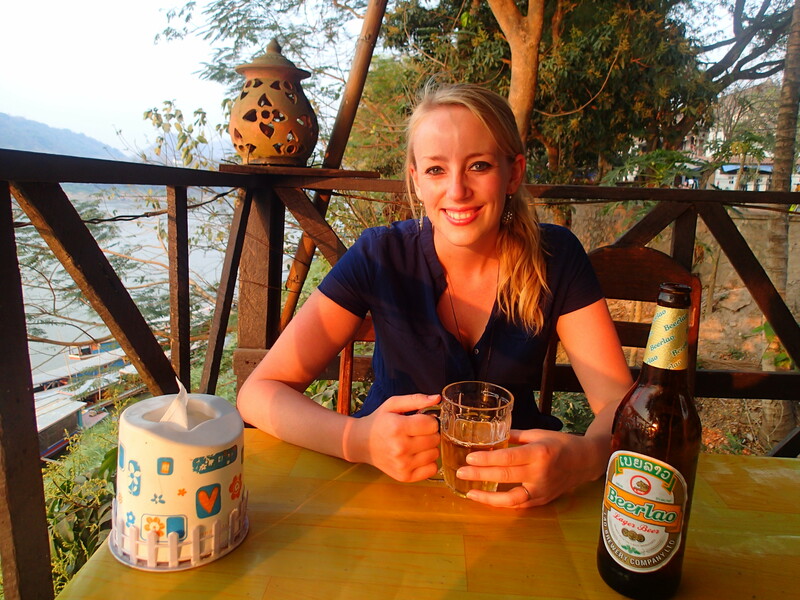 There also used to be a series of bars along the riverside fuelling tubers with unlimited amounts of BeerLao, Lao whisky and any drug you can put your mind to or lose your mind to. Added to this were zip lines, rope swings and variations on this theme. It’s all good fun until somebody gets hurt. Which they did. Regularly. After one too many deaths the Laos government cracked down hard, removed the swings, the zip lines and most of the bars. Tubing still remains but not as it once was. Given Jen and I didn’t really fancy even the modified tubing we were left to wander the village. That took ten minutes. We saw a lot of bars, some pretty ropey restaurants, about a million variations on wayfarer sunglasses, some tour operators and that was about it. This place was purely a tourist town with no semblance of Laos remaining except for the absolutely stunning setting. Even the normally friendly Laos people had become disenchanted with their lot and we struggled to see any smiles. Except from the staggering, drunken tourists who littered the streets from about lunchtime onwards. Thankfully we only had one day in Vang Vieng as we would be kayaking our way down to Vientiane the next day. Unfortunately, we had two nights there and I think between the two of us combined we had about 4 hours sleep over the two nights. A combination of the noises of the town followed by the chicken farm directly behind our bamboo-hut of a room ensured that no sleep would come easy. We were also plagued by mosquitos buzzing in our ear as we tossed and turned. Still, at least that’s over. 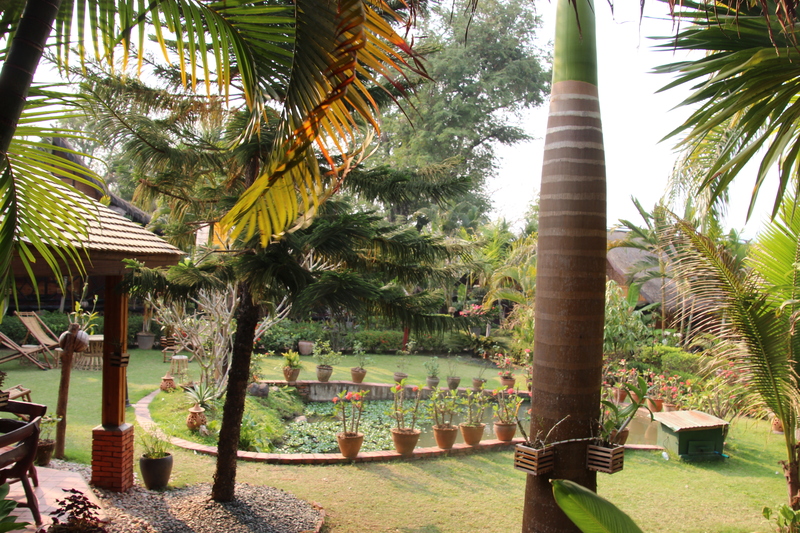 Right now we are sitting in an air-conditioned hotel room in Vientiane – I have never loved a hotel more in my life. 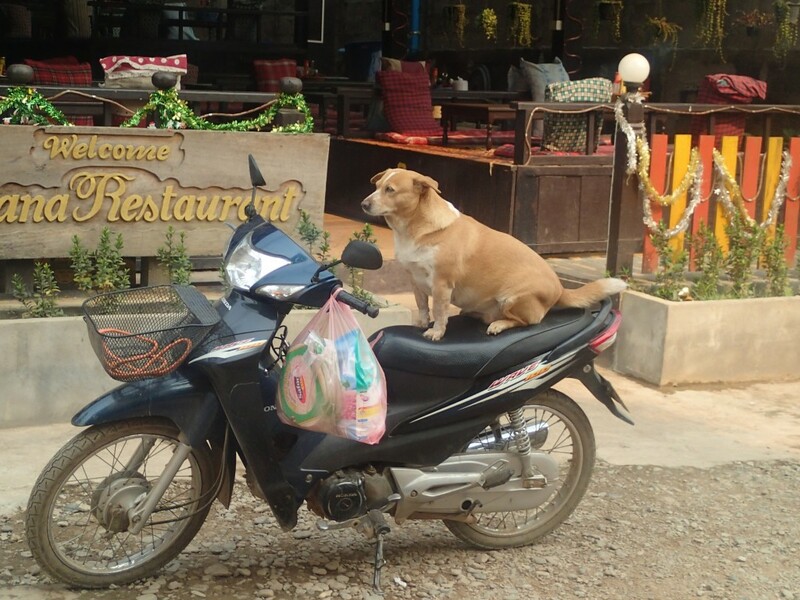 So conclusions: we probably could and should have given Luang Prabang more of a chance but it was hot we were tired and we did try and eat at some good restaurants. Vang Vieng is easily a place I would never return to but I can see its attraction to a certain age group. They had Friends on repeat in every bar. Seriously, Friends, all day, every day. We did watch a few episodes as Jen couldn’t believe that I didn’t really watch it growing up. Next up kayaking to the capital Vientiane and air conditioning!